The Edit is the business blog of Shoptiques. Anytime there is a new business blog on the scene it attracts my attention. When I was browsing Open Forum recently I stumbled on the feature – No Content, No Customers – featuring the fashion brand Shoptiques and its founder, Olga Vidisheva. What’s great about this entire situation is that this brand is looking at a certain customer and using content to be different. The fashion industry is extremely competitive. It’s difficult for a brand to stand out. By using content Shoptiques is adding to its differentiation points. Not only does the brand offer unique products, but it also offers useful advice and tips on fashion. For its target market, online fashion shoppers, this content is what attracts them first to the brand and gets them to stay loyal to the brand for the long-term. The Edit is mentioned as an online magazine. Whether it’s called a magazine, blog, forum or anything else the fact that content is there is what is driving this new form of commerce on the web. No longer are certain customer segments interested in just a faceless brand. There are segments of customers out there looking for more. The magazine seems to be expanding on what it offers to the target customers. Some might think that people will connect to Shoptiques the brand. In a way that’s true, but people connect with people. There is a voice behind each of the blogs on The Edit. Those people or those voices are what the customers are connecting to. It’s what those customers are looking for when they visit The Edit every day to learn about the latest fashion news and style advice. You can see the way the blog is working just as describe in How Business Blogging Works. 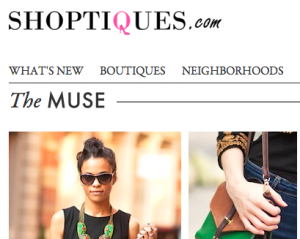 First, Shoptiques targets a specific customer. In this case they’re looking for women that need to purchase or want to purchase fashion items online. Others that prefer to purchase in retail stores are not targeted. If those people buy it’s okay, but it’s not the main focus. Second, once the target customer is attracted to the brand it’s all about building trust. Most of the time people aren’t ready to commit to a purchase with a new brand right away. There needs to be a level of trust in the relationship before money exchanges hands. This is where marketing comes in. For Shoptiques the marketing and trust building is The Edit. The customers read the information. They connect to the people behind the content. Trust is build. There is a bit of the Reciprocity Theory in play. A conversion occurs. Third, The Edit continues to drive interest from existing customers leading to more repeat purchases and referrals. Customers share the information in The Edit because there is actually something to share. Don’t forget that content is needed for social to work. That’s how it all works and it looks like Shoptiques is doing something to win the game in the really competitive fashion industry.